From 2007 to 2015, there was no significant change in the percentage of persons aged 2 years and over who had a dental visit in the past 12 months (44.5% in 2007 and 43.4% in 2015, age adjusted). 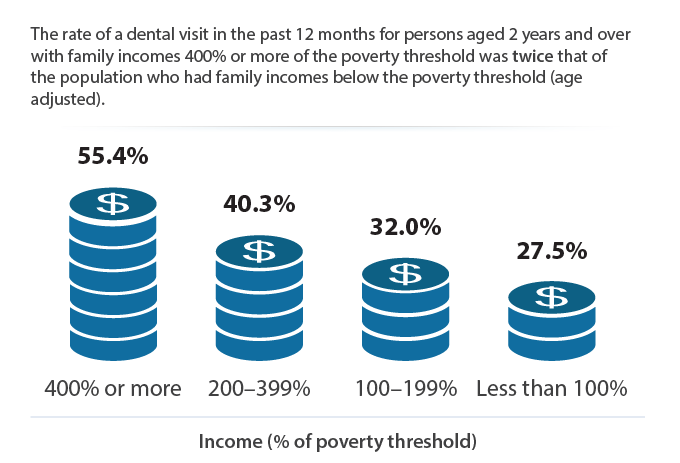 In 2015, several groups in selected demographic categories had the highest rate of a dental visit in the past 12 months, including females, the white non-Hispanic population, persons aged 2–17 years, those with at least some college education, those with family incomes 400% of the poverty threshold or above, and persons with private health insurance. Healthy People 2020 objective OH-7 tracks the proportion of persons aged 2 years and over who had a dental visit in the past 12 months. 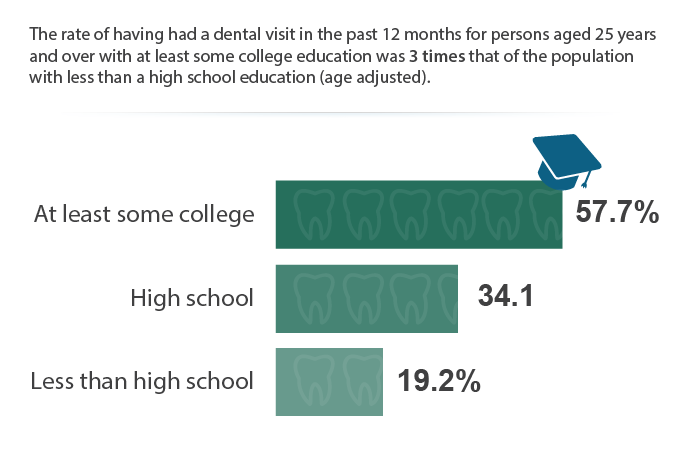 HP2020 Baseline: 44.5% of persons aged 2 years and over had a dental visit in the past 12 months in 2007 (age adjusted to the year 2000 standard population). HP2020 Target: 49.0% of persons aged 2 years and over (age adjusted to the year 2000 standard population), a 10% improvement over the baseline. Most Recent: In 2015, 43.4% of persons aged 2 years and over had a dental visit in the past 12 months. In 2015, females aged 2 years and over had a 14.9% higher rate of a dental visit in the past 12 months than males (46.4% versus 40.4%, age adjusted). Among activity limitation status groups, people without activity limitations aged 2 years and over had a 16.3% higher rate of a dental visit in the past 12 months than those with activity limitations (45.0% versus 38.7%, age adjusted) in 2015. Persons aged 20 years and over who were not obese had an 11.5% higher rate of a dental visit in the past 12 months than those who were obese (41.4% versus 37.2%, age adjusted) in 2015. Some, but not all, health insurance plans include dental coverage. All disparities described are statistically significant at the 0.05 level of significance. Data (except those by educational attainment, health insurance coverage, obesity status, and age group) are adjusted to the 2000 standard population using the age groups 2–17, 18–44, 45–54, 55–64, 65–74, and 75 years and over. Data by educational attainment are adjusted using the age groups 25–34, 35–44, 45–64, 65–74, and 75 years and over. Data by health insurance coverage are adjusted using the age groups 2–17, 18–44, 45–54, and 55–64. Data by obesity status are adjusted using the age groups 20–39, 40–59, and 60 years and over. Data by age group are not age adjusted. Age-adjusted rates are weighted sums of age-specific rates. Data for this measure are available annually and come from the Medical Expenditure Panel Survey (MEPS), AHRQ.